I am always looking for new baby gifts to make up for friends and family. I’ve recently had a bunch of friends have babies so I decided to batch sew up a bunch at the same time to send out. I’m dying over how cute these turned out and am now on the lookout of for cute, organic knits to have on hand for this very purpose. You can find the fabrics that I used here , here , and here . I made up two different quick little knit patterns that are great stash busters. I think that the two together is a perfect baby gift that is modern, thoughtful, and easily gender neutral. I made the harem romper by Brindille and Twig. It’s such a cute and easy little pattern. I sewed it up just as instructed except that I took a small wedge out of the center front neckline because I noticed that it set a little wide in a lot of the photos that I saw. But that is just a personal preference. I made the whole thing on my serger and each one took maybe 20 minutes. The most difficult part was adding the snaps, but luckily I finally got around the buying the snap setter and a bunch of size 16 snaps. It’s so much easier than the nightmare snap tool I had bought and chucked years ago. I also made up the rabbit ear teethers which is a free pattern from See Kate Sew. It’s a really simple sew and pretty darn cute. The fabric was all scraps from the romper and I bought the wooden rings through etsy here. That’s it. Love how these turned out and can’t wait to see all of the little babies in them. 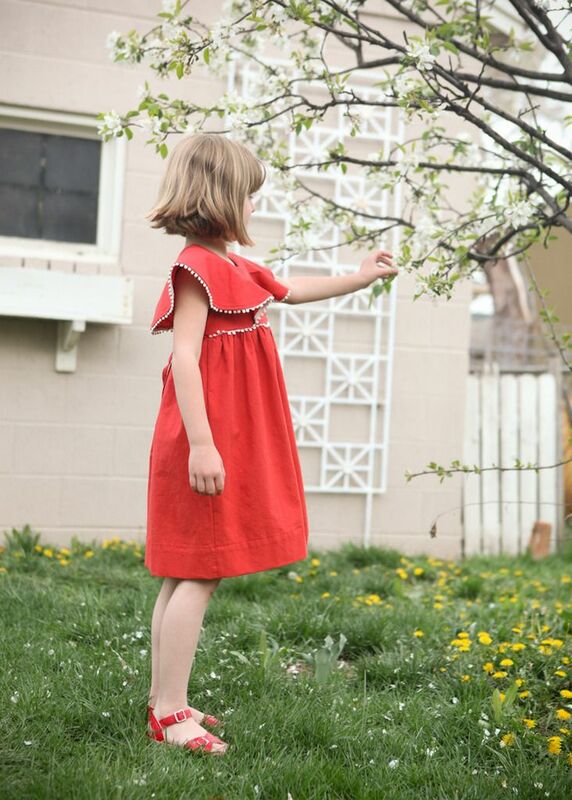 I recently sewed up a new Charlie Dress for my daughter as the last one is getting short. It’s such a cute pattern with it’s drop waisted simple silhouette and great twirling potential. Such a favorite little girls pattern in my house. Not to mention a very fast sew. For fabric I used some of Leah Duncan’s new voile fabric for Cloud 9. Her whole collection is so beautiful. I want to buy it all. I love using dark colored voile when sewing up clothing for my children because it has the benefit of being light and airy, but because of it’s darker color it’s still opaque enough that I don’t need to line it. Just as a heads up, I think that this pattern runs a bit wide in the chest area. It matches with the measurement chart, but if you are one that usually just goes with your child’s normal ready to wear size you might want to rethink that for this dress and compare your measurements to her chart. I think I cut a size 4 in the chest and size 6 in length for my daughter which worked out great. I also got to use my brand new labels from The Dutch Label Company on this dress and I love them. I already have a ton of labels with my logo on them, so when they offered to let me try out some of their labels I wanted to do something different and more personal. My daughter loves to tell anyone who compliments her clothing that I made it, so I decided to simply write “My Mom Made This” on them. I can’t say enough great things about working with Dutch Label Company. Their site is super slick, making it easy to see exactly what you are ordering. Also, you can do small runs instead of the 300 I had to order from a different company. If you are like me and your logo changed about 10 times in the first 3 years of your company, it’s nice to not commit to so many at once. I also appreciated the fast turn around. Because they are made in the US you will have your labels in hand within a week or two. 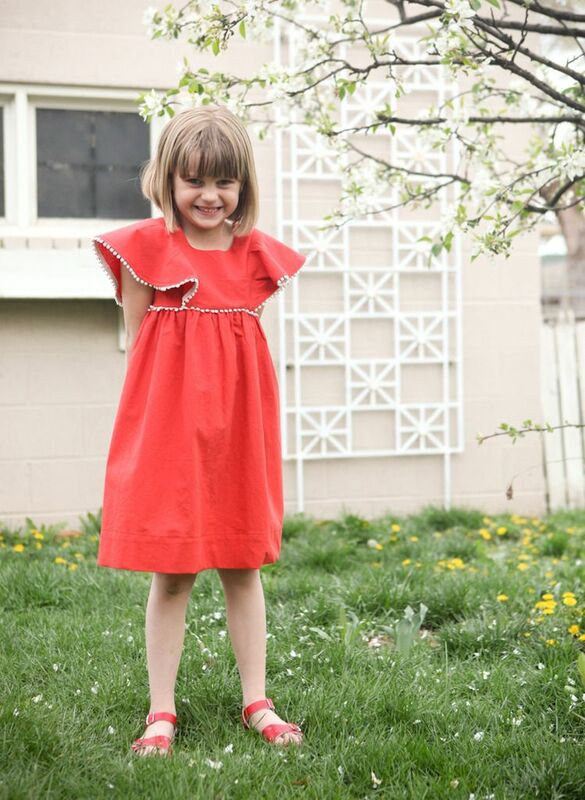 The Mini Colfax Dress is now for sale and is the perfect little version of the adult sized pattern recently released. It has a flattering A-line silhouette with a front yoke and visible binding around the neckline and armholes. The dress comes in 2 versions. View A is streamlined with one fabric for the whole dress. View B has patch pockets and a visible hem facing that is sewn up a in contrasting fabric along with the yoke and bindings. You can of coarse mix and match the two views for even more options. For fabrics I recommend easy to work with quilting cottons, lawns, double gauze and linens. All of these fabrics will press well and give beautiful crisp corners for the yoke and other details. The Mini Colfax is a really versatile pattern. 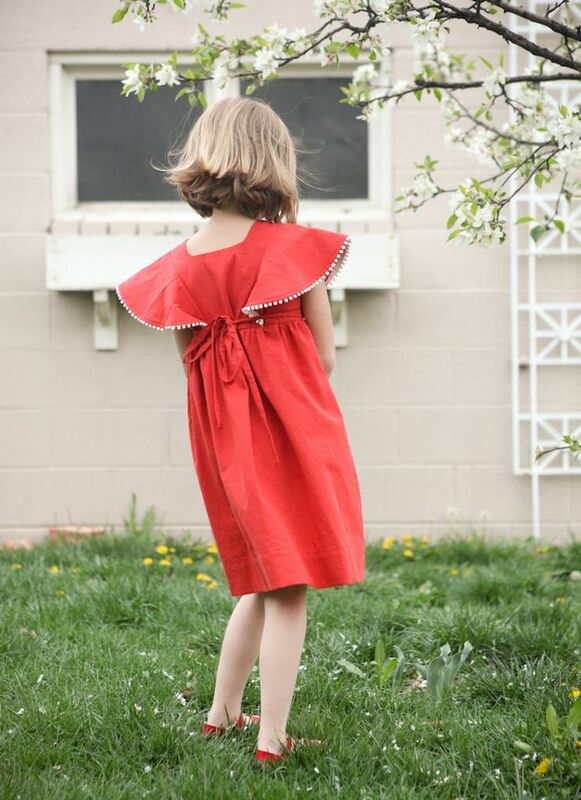 If you sew it up in a simple quilting cotton it makes a perfect everyday dress for warm weather. It can also be sewn up in a more precious fabric for a special occasion outing. Please let me know if you have any questions or head on over here for more information such as fabric requirements and sizing. 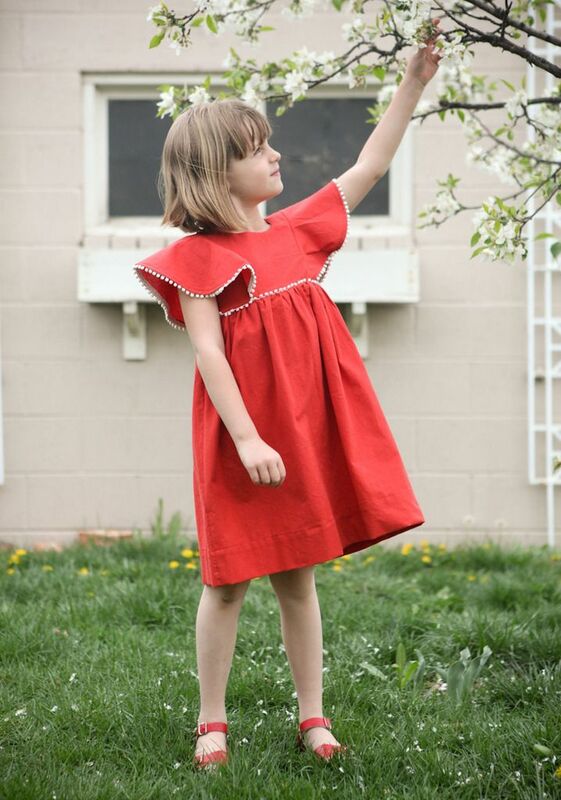 I wanted to sew something up for my daughter as an easter dress this year. I should really call it a spring dress because all three times she was supposed to wear it, including easter, the weather or sickness got in the way. This photoshoot a couple of days ago was the first time she actually put it on. I am really going to have to get used to this Denver spring thing. It’s quite the tease with 80 degree weather one day and a snowstorm the next. They say you really arn’t safe until after mother’s day so I guess we are not in the clear yet. I bought the Mori dress as soon as it was released because it was exactly the type of dress I had been looking for to make for my daughter. I wanted something that resembled the peasant like dresses that I wore as a child. Simple shapes and ruffles. Something that I could add pompoms to and maybe some embroidery to look like a lot of the Mexican inspired dresses I am seeing so much of right now. For the fabric, I chose some cloud 9 organic cotton. that I picked up at JoAnns. It has a nice texture to it that resembles an open weave that gave it the more handmade look I was going for. I chose this orangey-red that is my absolute favorite color and so hard to find. I will say though that I was very tempted by their mustard color as well. I also picked up some natural colored small pom pom trim. for some edging. The dress is really straight forward and has great directions. The bodice is fully lined and the skirt is left unlined. I did make a few changes. The most notable is that I did not face the sleeves. I found that on most of the versions I saw, that the sleeves looked a little heavier than I wanted. I like the idea of fluttery ruffled sleeves. My fabric is also not the thinnest (it’s a quilting cotton weight) so I knew that it would be too bulky if I lined it. Instead I turned it under at 1/4″ twice and then added the pompoms to the edge. If I were to sew it again, I would sew it up in a much lighter weight fabric, like a voile. I would line both the bodice and skirt, but leave the sleeves one layer. I would also like to try shortening the sleeve ruffle to about half of its width at the shoulder. I think it would just look more summery and casual. I have visions of making the dress up in a light cotton gauze, with some embroidery on the bodice. Hopefully I can find the time to make that happen.